ROCKVILLE – A rarely-heard gem of American operetta, John Philip Sousa’s The Charlatan, will be presented in a semi-staged concert production with live orchestra by The Victorian Lyric Opera Company at the F. Scott Fitzgerald Theatre (located at 630 Edmonston Dr., Rockville, MD) in early September. This show will only have three performances: September 5th, 6th and 7th. The evening performances on September 5th and 6th will begin at 8pm. The matinee on Sunday, September 7th will have a 2pm curtain. A special free lecture will be given at 7pm on Saturday, September 6th before the performance. The guest speaker will be noted Sousa scholar Patrick Warfield, the author of Making the March King: John Philip Sousa's Washington Years 1854-1893. 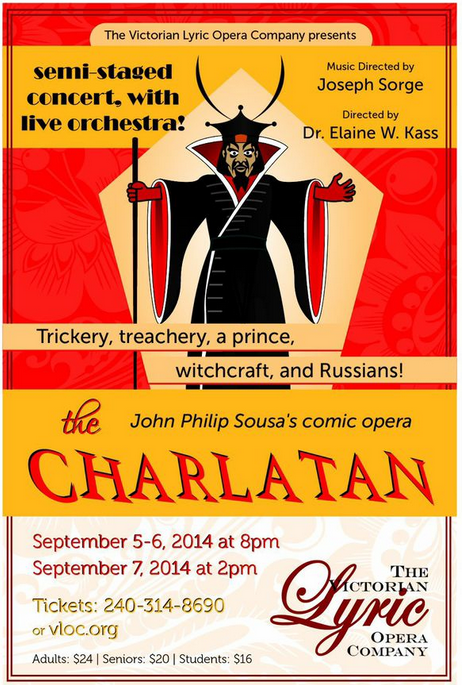 Tickets for The Charlatan are $24 for adults, $20 for seniors, and $16 for students. Deftly enhanced by stage director Dr. Elaine W. Kass, the plot is an entertaining farce for all ages. The story follows the fortunes of a comical cast of characters including the gallant Prince Boris, his scheming uncle Gogol, and a crafty magician named Demidoff who manages to pair up own daughter, Anna, with the royal prince. The robust chorus sings as the boisterous townsfolk in the small Russian village where the operetta takes place. Through amusing plot twists, witty banter, and rousing musical numbers, all ends well by the conclusion of the show. Join The Victorian Lyric Opera Company for a chance to hear this charming music for yourself – performed by a full live orchestra and talented vocalists for just one weekend. For further information visit the website at www.vloc.org, or call the F. Scott Fitzgerald Theatre box office at 240-314-8690. The Victorian Lyric Opera Company (VLOC) is a non-profit organization founded in 1978 to perform musical works of the Victorian era. VLOC's first show was Trial By Jury paired with Cox and Box. Since that time the company has performed every operetta in the Gilbert & Sullivan canon, most of them many times over. Lately, VLOC has branched out into other European operettas and even grand opera, such as Mozart's The Magic Flute & Donizetti's The Elixir of Love. The mission of the company is to produce high quality performances of light operatic works, providing educational and performance opportunities to the community. In 2011, The Victorian Lyric Opera Company merged with The Forgotten Opera Company. VLOC is a resident company at the F. Scott Fitzgerald Theatre at the Rockville Civic Center, located at 630 Edmonston Dr., Rockville, MD 20851. Season tickets are now available! Save at least 10% by subscribing to our three-show main stage season, including: The Charlatan, Haddon Hall, and Ruddigore! Call the box office at 240-314-8690 to subscribe. 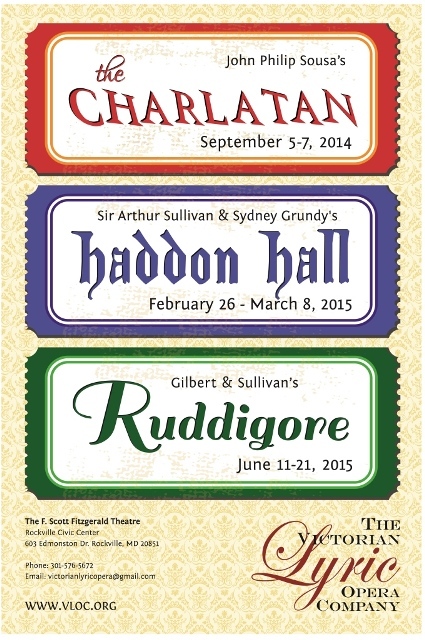 Read about the cast of The Charlatan on the VLOC blog! The Forgotten Opera Company, DBA The Victorian Lyric Opera Company is a 501(c) charitable organization. Please consider joining our list of loyal donors in supporting VLOC by making a gift today. Copyright © 2014 The Victorian Lyric Opera Company, All rights reserved.